I love this glorious time of year when there is an abundance of produce. I look forward to seeing my favorite fruits and veggies go on sale because they are finally in season. I especially love it when the berries go on sale. Strawberries, blueberries, blackberries, raspberries; I have yet to meet a berry I don't like. A few years ago, I bought several pints of strawberries. My plan was to make strawberry jam, but I ran out of time. Instead, I decided to freeze the strawberries for smoothies. I cut them into slices and put all of the slices in a couple of gallon-size freezer ziplock bags. In theory this was a great idea, but I ran into a problem: all of the strawberries froze into one huge ice chunk. I only needed a few strawberries for my morning smoothie and every morning it was such a pain to break apart the ginormous ice chunk. Sometimes I resorted to putting my ice chunk in the microwave to break it up. Other times I would hammer it with a spoon. I think I even dropped the ziplock bag on the floor a few times to rid myself of the ice chunk. It was around this same time that I was preparing to teach a class at church on making freezer meals. I checked out a few freezer meal cookbooks at the library for more ideas, and I came across a chapter in one of the books called, "Flash Freezing." This flash freezing idea was awesome! Flash freezing is basically to freeze something for a short amount of time before packaging it. 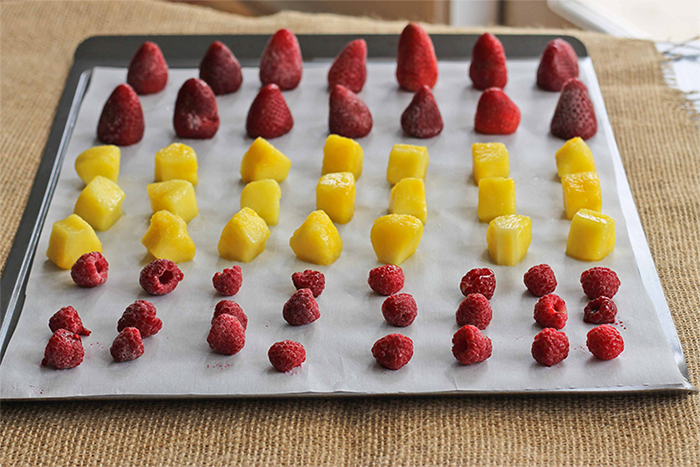 So, for example, when you have chunks of fruit to freeze, place all of the individual pieces of fruit on a cookie sheet lined with parchment paper. Stick the cookie sheet in the freezer for about 10-15 minutes. 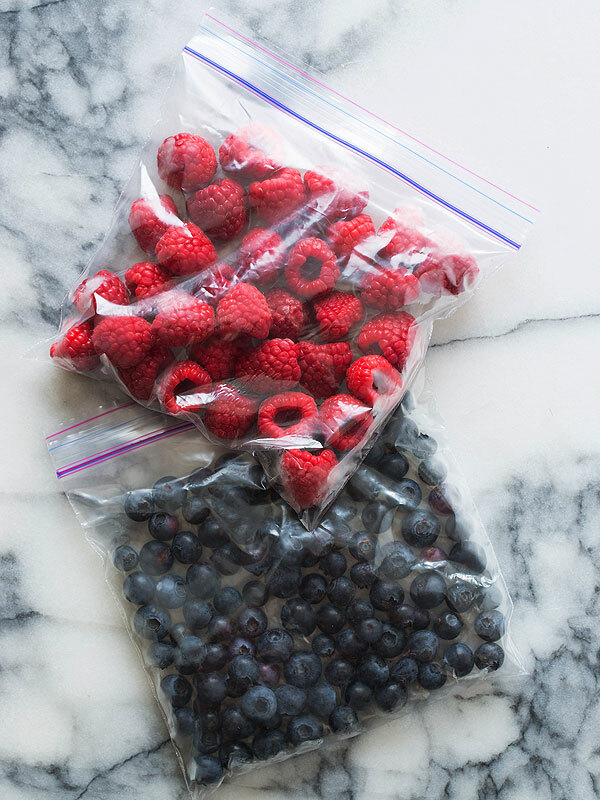 After being in the freezer for a small amount of time, the fruit becomes solid enough that it won't stick to the other pieces of fruit when you put them in your freezer bag. You will have individual pieces of frozen fruit instead of a huge ice chunk. This process of freezing your fruit may take a bit longer, but trust me-not having to break apart an ice chunk every morning will save you loads of time in the long run! This concept is not new and probably one that many of you have tried. In fact, most food companies that package frozen foods use some form of flash freezing. Just tonight, we had Rhodes rolls with our dinner. Rhodes flash freezes each of their dough balls so that you can easily take out the number of rolls you need. Besides fruits and vegetables, you can also flash freeze cookie dough balls, slices of cheese, pieces of meat, pancakes, or slices of bread. What things do you like to freeze? I hope you, too, can enjoy your freezer food this summer without the ginormous ice chunk!